Amenities provided by third-party vendors (for example utility companies or subcontractors) are beyond our control. We do our best to provide services such as cable television, Wifi, and resort telephones. Should these be unavailable for part or all of your stay we will do our best to help restore services, but ultimately cannot be held responsible. Should you absolutely require internet access we recommend you make arrangement for these services through a cell phone company. A pack-n-play and booster seat are available at no extra charge, but must be requested via email to alohacondos@vacationrealtyhawaii.com at the time of booking or with reasonable notice prior to arrival. If more than one is needed, then the guest would have to rent one from a local rental company. Peaceful mountain view. Newly remodeled one bedroom with 2 full baths, 2 king beds and sofa bed. Full kitchen plus kichenette with everything! 2 Large flat screen TVs with DVD players, air conditioning and a peaceful garden view. Great unit at a great price! One bedroom plus studio unit with a full kitchen and 2 baths. Can sleep seven comfortably. It may not have an ocean view, but when we woke on our first morning to a view of the mountain with SEVEN waterfalls (it had been raining all night) we felt immediately welcomed to the Garden Island. In addition to an amazing mountain view, the small forest below sounded like a rainforest full of birds who were especially vocal (but not in an annoying way) at sunrise and sunset. As opposed to the balconies of other condos we have rented, this balcony is very private. We could sit out and enjoy breakfast without being on display - no other balconies overlooking or walkways below. Additionally, the location is PERFECT! A very short walk to the pool, lobby, Happy Talk Lounge, fitness center and parking lot. This is especially important when you have someone unable to climb steep walkways in your party. Some of the lower buildings on the property have wonderful views but horrible hikes to the parking lot and pool - on several occasions we had to seriously think twice about leaving our unit when we knew we had a mild hike ahead of us! Conversely, condo 1525-26 is so conveniently located and made trips from the grocery store with multiple bags in hand a breeze. These two adjoining condos are the perfect setup for travelling with multiple parties. We visited Kauai with my mom who really enjoyed the privacy she could get each night by closing the door as my husband, children and I watched movies. The sleeper sofa in condo 1525 was actually very comfortable! And the kitchenette worked perfectly for cooking meals for the five of us - which helped tremendously with keeping our meal budget in check! It came equipped with toaster, coffee maker (and filters! ), steamed rice cooker and even a blender (pinacoladas!). We also really appreciated the availability of beach chairs and boogie boards. As if that isn't enough, a stay in this condo also includes all the amenities of the Hanalei Bay Resort: beach/pool towels that can be exchanged multiple times daily, excellent wifi (premium service can be purchased and my kids said it was better than what we have at home), poolside bar with live ukulele musicians, Happy Talk Lounge with live music nightly, Savage Gift Shop filled with all kinds of wonderful treasures and a ride in a golf cart, upon request, to your car or down to the beach. Grocery shopping at Foodland in Princeville is very convenient and being located so close to Hanalei, Anini Beach and Kilauea is definitely a bonus. 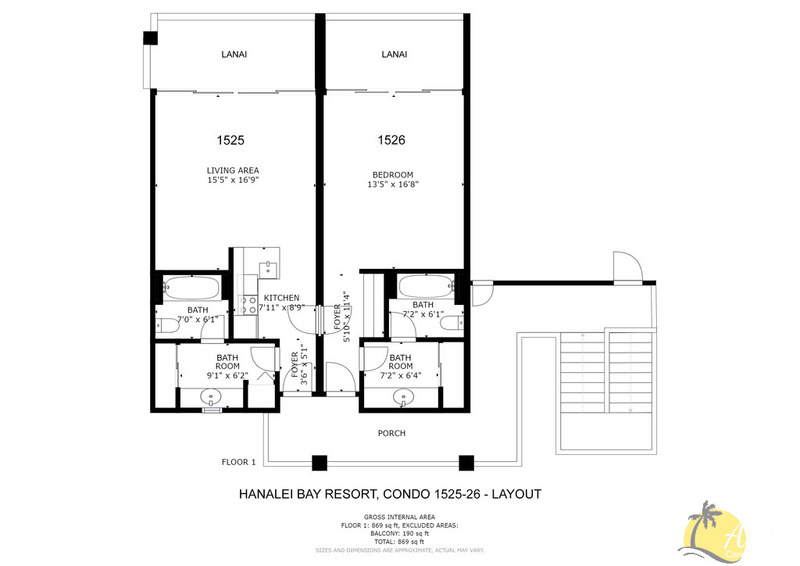 We would definitely stay in condo 1525-26 again and would absolutely book through Aloha Condos & Home in the future. They were very communicative, answered my emails promptly, provided very clear information and made the booking process easy to navigate. Many mahalos for our wonderful Kauai vacation! Resort was great, the front desk staff were awesome and funny, and the pool was amazing. Unit was fully functional for us, and as described. The layout is two adjoining studio units, one with full kitchen and sofa bed, hence the other door can be closed as the bedroom. The view of the mountains was fantastic to wake up to. We made good use of the beach gear and really appreciated having it.